Life has been a little hectic and chaotic for me lately, so I haven’t had a chance to make that much new artwork. However, I still managed to find some time. This is a commission that I completed the other day for a friend from high school. I used a pretty limited color palette for this piece, which was challenging and fun in it’s own way. I tried to incorporate a decent amount of texture in the background as well as for the dog. 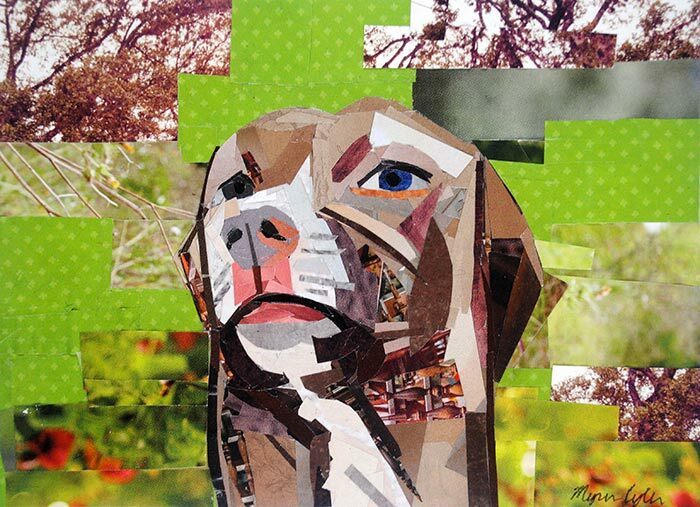 This collage was also a challenge in the sense that the dog’s head is tilted at an unusual angle. Anyway, I enjoyed tackling this pet portrait of a dog from Peru. 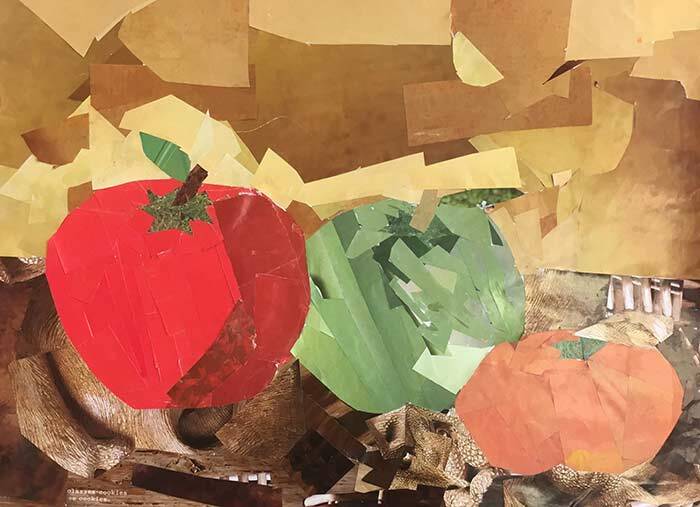 A class of K-8 students from the St. Cyril School in Tucson, Arizona studied my collage art and made their own still life collages. The students did a wonderful job of incorporating solid colors, textures, and text into their collages. It was fun seeing how they tackled subjects like coffee cups, like the piece above. It was fun seeing the different styles of the students. That’s one of the things I love about making art – every artist has his/her own unique voice. And it’s absolutely wonderful seeing the voice that artists have at all levels. Overall, I was impressed with what this class came up with. I hope the students continue to make collages in the future. Three of my original collages are currently on display at the i.d.e.a. 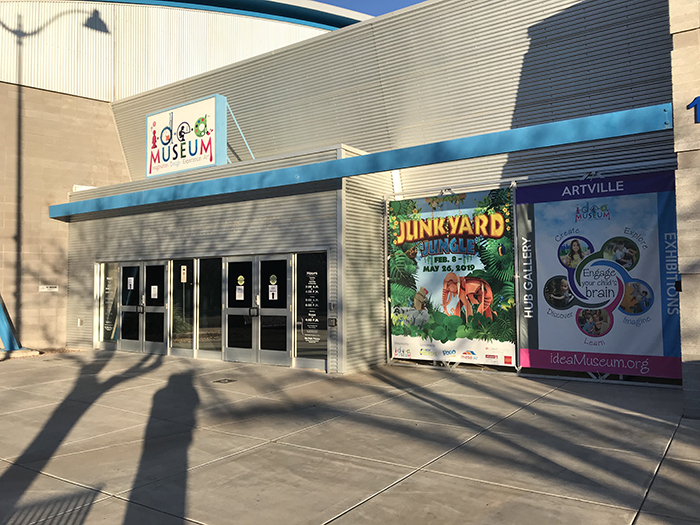 Museum in Mesa, Arizona. They are in an exhibit called “Junkyard Jungle,” which features the work of artists who use recycled materials. The show opened on February 8th, and runs until May 26th, 2019. The curator of the exhibit was kind enough to send along photos of the installed artwork. Since I won’t have a chance to see the exhibit in-person, it was great getting to see so many photos of the exhibit. If you’re in the Mesa, Arizona area, you should definitely try to stop by to see the show. It’s a great mix of artwork and creative activities for children. 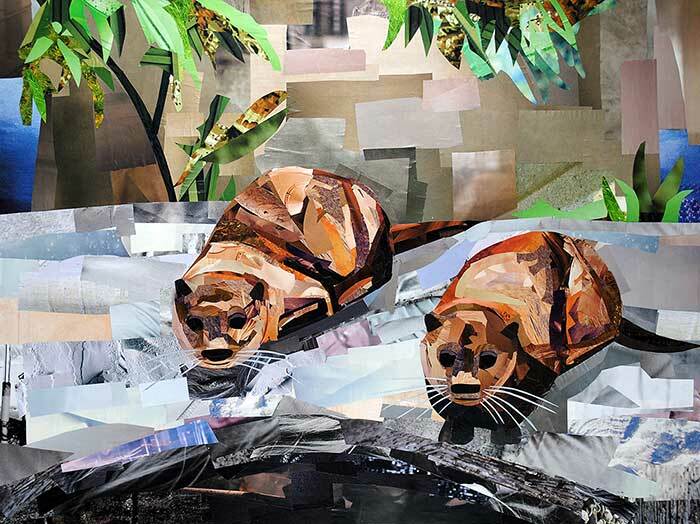 Above you can see my framed “The Otter Sisters” original collage. There’s even a collage station where children can create their own paper collages. Above is my “Lipstick Lizard” framed collage. All my artwork in the show is available for sale. 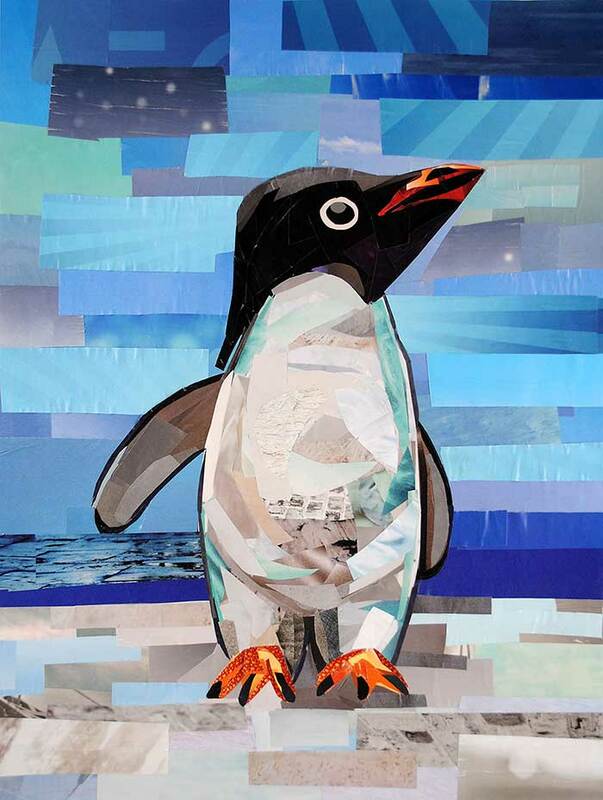 I’m excited to announce that three of my original collages, “The Curious Penguin,” “The Otter Sisters,” and “Lipstick Lizard,” will be on display at the i.d.e.a. Museum’s Junkyard Jungle exhibit. 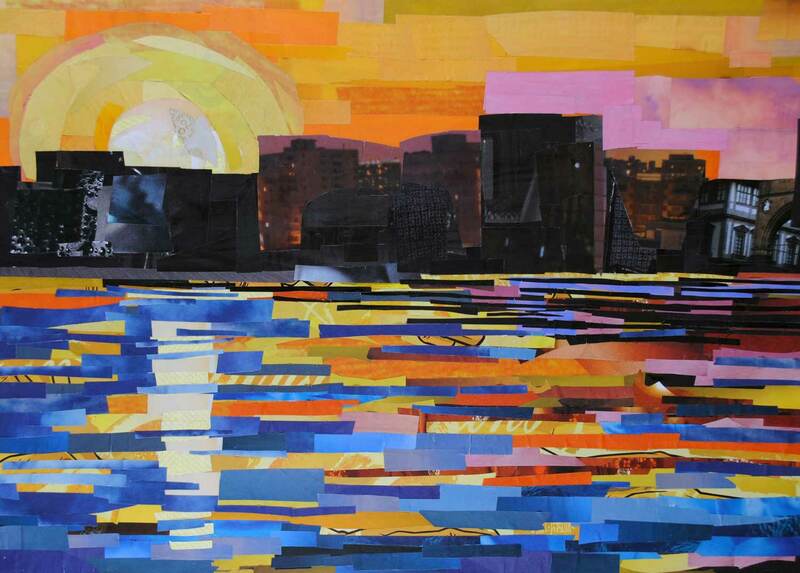 The show features artists from around the U.S. and U.K., who transform discarded materials into unique works of art. In conjunction with the exhibit, the museum has a number of planned activities for children of all ages. 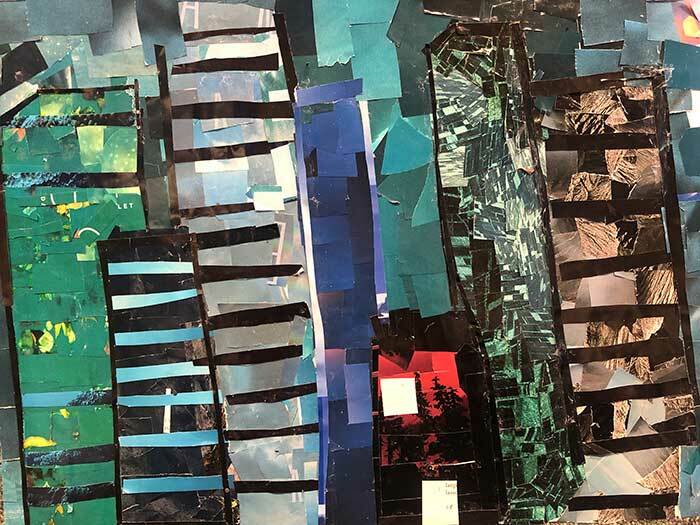 The other day I heard from a teacher from the Year 5 Rowan Class at Beecroft Garden Primary school in London, where the class studied my collages and then went ahead and made their own collages. The students are 9-10 years old, and they really did an amazing job at tackling the collage medium. The class was also studying the “Men of the Docks” by George Bellows in a project with the National Gallery in London. The children spotted the 1912 New York skyline in the background of the picture and went from there with creating their compositions. Above you can see that some of the children used mixed materials. They used a great mix of textured magazine strips as well as solid colors. It was wonderful hearing from another classroom. It always makes my day when teachers send student artwork that was inspired by my technique. 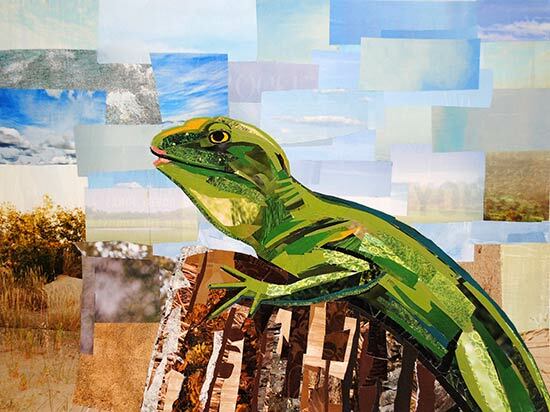 I hope to continue to find ways to help bring collage into the classroom. I’m continuing to work on my dog series. This time, I thought I’d incorporate a lot more texture with the dog’s face. Usually I use more solid colors for the dog portraits, while saving all the texture for the background. It was fun changing things up for this piece. I’ve decided to revisit dog portraits, to tackle a series of different dog breeds. Over the years I’ve had a tendency of tackling the same sort of dog portraits, and I’d like to study a few different types this time around. 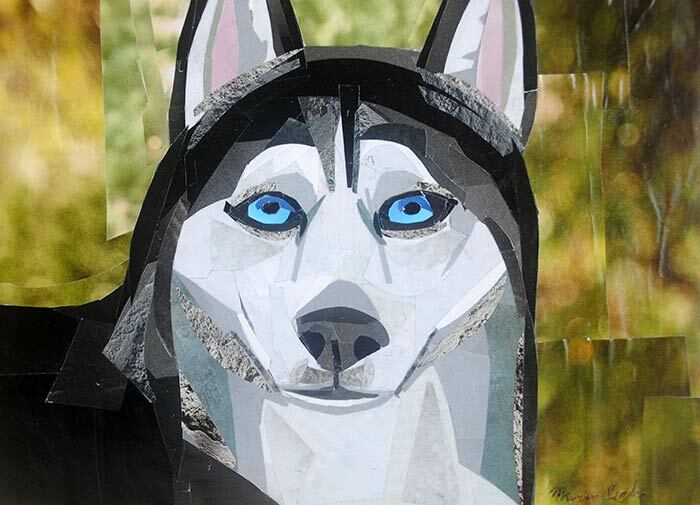 I enjoyed collaging this Husky collage. 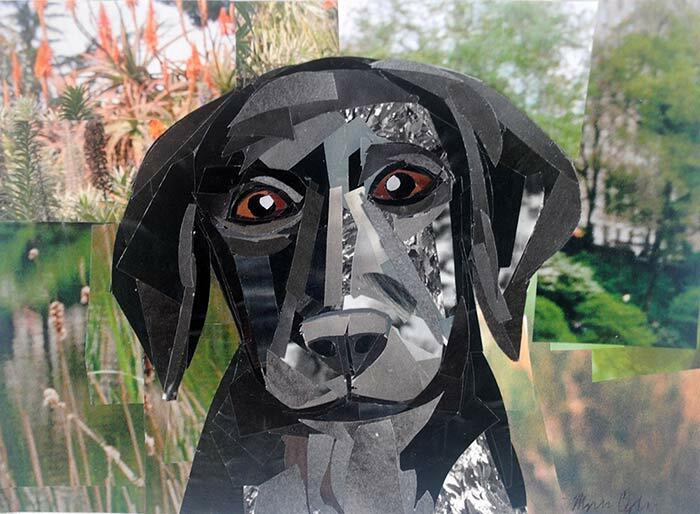 It was my first time collaging a Husky, and I enjoyed working with the shadows for the dog’s eyes and incorporating bits of texture. Texture is the feel, appearance, or consistency of a surface. Artists use texture to add depth, interest, or balance to different areas of their artwork. Texture can exist as the illusion of different textures (feathers, sand, etc.) or it can exist as actual layers that create a feeling or consistency when touched – such as thick paint applied with a palette knife or layered paper. 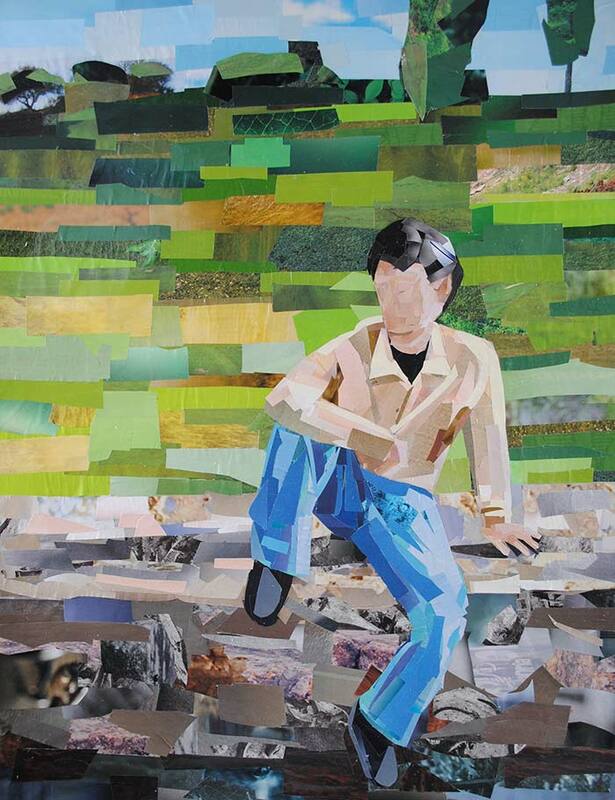 Artists use texture for a number of reasons, depending on the vision behind their work. Sometimes texture is used to give the illusion of depth or making a piece seem more realistic — the more detail put into the use of texture (such as the texture of leaves, skin, etc. ), the more realistic a work of art can look. Texture can help set up the atmosphere of a scene. Other times, an artist may use texture to add interest to his or her work. It can be a stylistic choice, where an artist makes use of texture for representational, realistic works of art, or nonrepresentational, abstract works. Use of rough and smooth texture can help craft an artist’s vision. Related to using texture for adding interest, it can also be used for balancing out compositions. 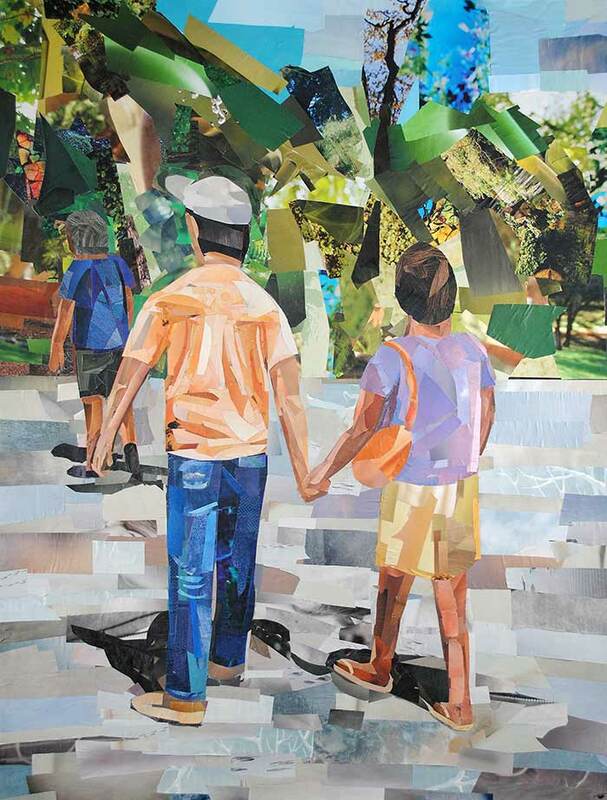 Artists can use texture to help guide a viewer’s eye through a work of art. They can use smooth or rough textures in different areas to either call attention or ignore different aspects of their composition. Texture is one of the many elements an artist can use to construct a work of art. It’s something that varies from artist to artist, with how he or she chooses to incorporate it. Artists use texture to shape their unique works of art, by using it to add depth, balance, or interest to different area’s of their artwork’s surface. 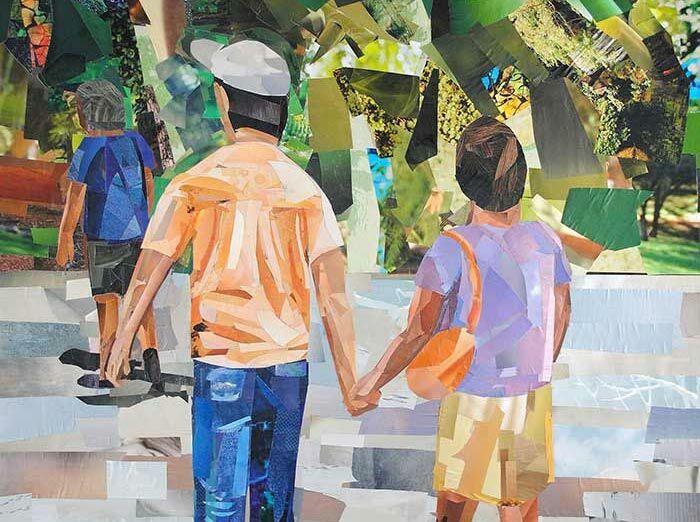 I’m excited to announce that I’ve donated my “Strolling in the Park” and “Figure Landscape” collages to an upcoming charity art auction called PawCasso. The event is taking place on November 3rd, and raises money for Homeward Trails Animal Rescue. You can find out more about what’s up for auction, as well as get tickets to the event, by visiting their website. There are all sorts of plastic drawers you can use for organizing drawing tools, scraps of paper, paint, clay, and more. Organizers will help keep your tools and materials in order, so they don’t end up scattered around your studio or home. Portfolios can help organize your flat or 2d artwork, and can also serve as an excellent way to transport your artwork to other places like galleries or studios. Over the years, it’s far too easy to lose track of the artwork you’ve made and where it is. Creating a spreadsheet inventory, can help you keep track of where everything is. It helps to keep a thumbnail of every work of art in the spreadsheet, along with the date of creation, dimensions, location (at your home, in an exhibit, or sold to a client), client info and date sold (if applicable), exhibits/publications it’s appeared in, and if you have any additional notes on a specific work of art. Then you can keep your inventory updated whenever you create new artwork or sell and exhibit existing art. 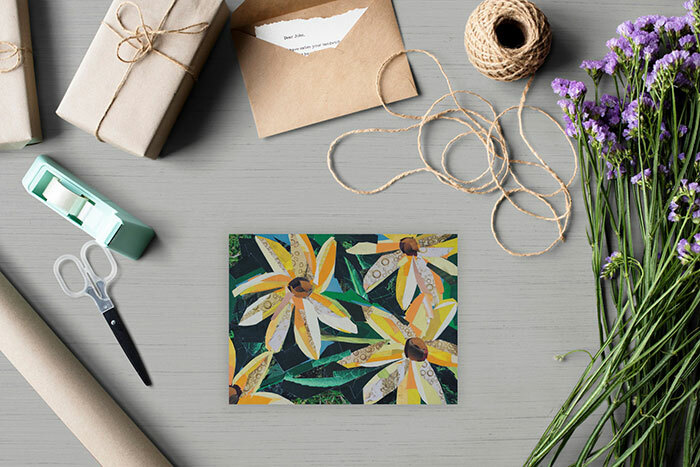 On your computer, keep a folder filled with marketing materials that you use to promote your artwork, such as your artist resume, biography, artist statement, and any digital files of postcards or other mailers you’ve used to promote your work. By having everything maintained in one place, you can easily find your art-related materials whenever you need to promote upcoming shows. You can also throw out outdated, printed marketing materials that are no longer relevant, especially when it’s easy enough for you to print out a new, updated copy. Maintain a calendar that has all the dates related to your exhibits, gallery application deadlines, and art-making schedule. By sticking to a schedule for when you make artwork, and when you plan to take a couple of days off from it, is important to ensure that you are consistently making artwork and working on your craft. If you have a studio, that should be your dedicated space for your artwork. Try not to let your artwork and materials clutter your home or non-studio spaces. If you don’t have a dedicated studio, dedicate a specific section of your home to your art-making. By defining your art space, you can constrain the materials and art to that one space, and you don’t have to declutter it from other sections of your home. If you haven’t used something in a couple of years, chances are you won’t end up using it any time soon. Remove the excess by tossing out, recycling, or donating anything you haven’t used in a while. By simplifying your workspace, it’ll be a lot easier to stay organized. Staying organized makes any job a lot easier. Instead of sifting through piles of marketing or art materials, having a proper filing system can make it easier to locate what you need when you need it. 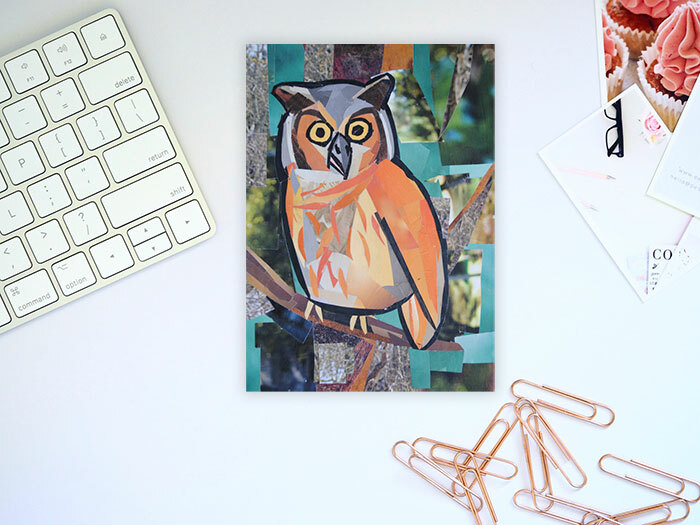 By keeping your creative space more organized, you’ll have an easier time running your art business.